Atlanta — Upwards of 200 people gathered at the Memorial Drive Presbyterian Church, a center for immigrant and refugees services on Dec. 12, to publicly and visibly denounce the racist and Islamophobic pronouncements of politicians, both nationally and in Georgia. In the past, Gov. Nathan Deal has repeatedly stated that Georgia wants no additional refugees. Most recently, he announced that besides calling Syrian refugees “unwelcome,” he has directed state agencies to refuse to assist them in receiving federal benefits such as food stamps. During Deal’s tenure in office, Georgia has passed numerous pieces of anti-immigrant legislation. In addition, the notorious, privately owned and operated Stewart Detention Center is located in Lumpkin, Ga. About 1,800 undocumented men are held there in horrible and inhumane conditions, some for years, awaiting deportation. The multinational, multigenerational crowd assembled on busy Memorial Drive had a completely different message. 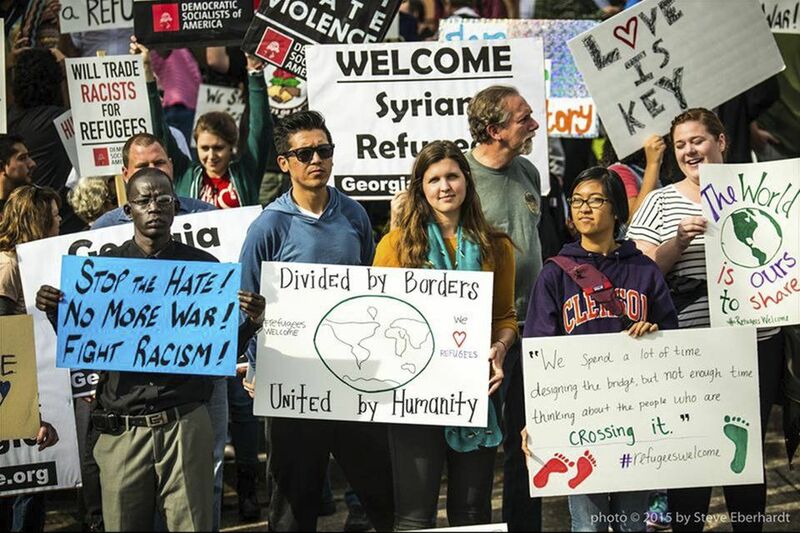 Initiated by the Georgia Peace and Justice Coalition, the rally was billed as “Welcome to Georgia” and a declaration of solidarity with refugees and immigrants. At the speakout, refugees from Sudan, Syria, Pakistan, Congo and Somalia described the devastation, suffering and pain their countries have endured because of war and their hope to be able to live in peace and security. Then, it was time to take the message to the street as human billboards reaching out to the hundreds of passing motorists. The billboards stretched the full length of the block with their signs calling for “No more war,” “Solidarity with refugees and immigrants,” “Fight racism,” “Welcome Syrians” and “Human rights for all.” Drivers honked their horns in approval; passengers raised fists out the windows in agreement; smiles and waves were abundant as people slowed to take pictures. This section of Memorial Drive connects largely African-American neighborhoods where many refugee and immigrant families have settled. A right-wing county commissioner and state legislators have targeted an apartment complex directly behind the church with vicious scapegoating, blaming victims of U.S. militarism and economic exploitation for community blight and crime. Invigorated by their unity, dozens of people, once strangers, stayed to talk about what to do next.